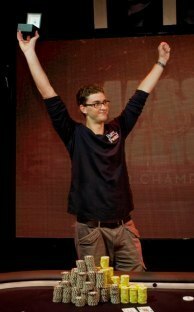 Tyron Krost had graduated from the University of New South Wales just a few months before the 2010 Aussie Millions began. He majored in Commerce and Science and had begun working at his parent’s furniture business in the six months following his graduation. Despite previous cashes at the World Series of Poker, including a 249th-place finish in the main event in 2008 that earned him $35,383 Krost had tired of poker after graduation and he decided to play less with the hours of a full-time job taking a big chunk out of his time. The 24-year-old native of the Sydney area was one of 746 runners in the record field in the 2010 Aussie Millions main event that year and when the tournament ended he was the champion, beating a tough final table that included poker professionals Annette Obrestad and Sorel Mizzi. Krost was a newly-minted millionaire who took home $2 million AUD in prize money. “I’ve never had an out-of-body experience like I had when the turn and river were being dealt out. Everything was in slow motion,” said Krost of the final hand in the tournament. It was about as life changing as a victory in a poker tournament gets outside of the Rio in Las Vegas. Newspapers and television news shows quickly ran with the story across Australia and he was crowned a wunderkind overnight. They claimed that his prize money topped the earnings of tennis professionals like Rafael Nadal and Serena Williams, who were also in town at Melbourne Park for the Australian Open. This was ironic considering that Krost played tennis competitively even up to his university days, but also correct. Krost admits that the win itself and the first couple of days after the biggest achievement in his life were a blur. Card Player caught up with Krost at the 2011 Aussie Millions main event and the experience of just one year on the road appeared to have given him the confidence and poise that come with a lifetime of experience. Read on below to discover how Krost learned the game, the path he took to his greatest triumph, and see how he has adapted to his new lifestyle. Krost started playing poker in five-card draw games with friends during his last year in high school, where matchsticks were often used as chips. He moved to limit cash games and eventually deposited $50 into an online account. “I started initially with limit hold’em, playing $1-$2, $2-$4 and eventually worked my way up to $10-$20. Then I switched to tournaments and just played in them from then on,” said Krost. He built his bankroll with his first substantial tournament victory and it came in a $22 online MTT. After that he was hooked and a trip to Vegas was soon in the cards. In addition to the aforementioned main event cash Krost scored one other cash during his trip to the 2008 WSOP. He finished in 193rd place in a $1,500 no-limit hold’em event to add $3,153 for his first live tournament cash ever. The early trip to Vegas did leave a lasting impression on Krost, even after he has traveled the world to play poker. “Australia definitely has some good tournaments but you can’t really beat Vegas as a poker destination. I like all of the tournaments in Europe, they have a good feeling to them, like London in September, there are a lot of good tournaments there during that time, but Vegas is the best,” said Krost. As his time at university came to a close his free time shriveled up as the pressures of the real world settled in and Krost turned away from the hobby that had been profitable for him at times. Poker has been fun for awhile, but it didn’t really look like a career opportunity at that point. “I was playing a lot but last year I’d had enough of the game and didn’t want to play as much. I had some bad downswings so I withdrew my money, finished university and had a six-month break from poker,” said Krost. That was until the $700 satellite began on a Sunday afternoon. When he was asked about the largest way his life has changed since his win at the Aussie Millions main event Krost responded, “I didn’t plan on traveling and playing in all of the big poker tournaments around the world last year.” He laughed and smiled as he responded with an exuberance that befits a person who can’t believe the good fortune he has to be leading a life that others dream about living. He has scored five cashes since venturing out onto the world wide tournament circuit. He finished in seventh place at the World Poker Tour Spanish Championship in Barcelona in May, and another trip to Vegas soon followed for the WSOP. He cashed twice once again, scoring his highest WSOP-finish ever in a $2,500 limit/no-limit hold’em event (36th place) and he added his second main event cash, coming in at 726th place in the second largest poker tournament of all time. In the latter stages of 2010 Krost turned his attention back to the Asia/Pacific arena and he scored two cashes on PokerStars-sponsored tours in the region. He finished in 16th place in the Melbourne main event during season two of the Australia New Zealand Poker Tour and he added a 29th-place finish at the Asia Pacific Poker Tour Grand Final in his hometown of Sydney this past December. Throughout it all Krost has been learning to deal with the added attention he has received and focus on improving his poker game. “I know my live game has improved. I get recognized a lot more so I have to adapt to that. On the average people try and bluff me a lot more. They call me down a lot lighter than they used to so I have to adapt to that. I think my live game has improved a hell of a lot this past year, just picking up on tells,” said Krost. He also offered this advice for any player who follows in his footsteps and feels the pressure of a deep run in a major tournament early in their career. “I think it is pretty easy to get swept up in the moment. You look up at the screens and see a lot of big prizes. And especially when you get later in the tournament there is a lot of action going on around you. You just need to focus on your table and your hands. You need to not let the situation get the best of you,” said Krost. His interests outside of poker still include tennis, “I was reasonably good at that, but I kind of gave it away once I finished at school,” said Krost of his other sport. He still tries to play whenever he can find a court on the road. And whenever he is home he tries to enjoy the beaches that have made his town world famous. “The beach culture in Sydney is probably the main thing. When you’re growing up you spend all of your holidays and weekends on the beach, Bondi beach and all of those places,” said Krost of his hometown. His parents have been supportive throughout the process as well but he expected nothing different. “They’ve been very supportive with everything I do, like when I was growing up with the tennis, and when I started playing poker they were supportive with that too,” said Krost. He also thinks that poker will be a big part of his future but he keeps an open mind as well. “I definitely want to keep playing poker for the foreseeable future, especially the tournaments because I really like playing in them. I’ve got other interests too and I might want to start a business in the future,” said Krost. Time will tell how long this Aussie youth decides to keep traveling the world from his base on the island continent in search of another huge poker score, but you can tell he has a good head on his shoulders as well as gracious manners. Although he busted out of the 2011 Aussie Millions main event short of the money bubble he did stick around at the Crown Casino in Melbourne long enough to make an appearance at the final table and wish each of the finalists good luck as they attempted to become the next Tyron Krost.